President Trump's 24 hours in Quebec while attending the annual G-7 Summit was every bit as confrontational as we imagined they would be. The president has enraged his fellow world leaders, insulted Justin Trudeau, who's hosting the summit in Quebec and whom Trump repeated referenced as just "Justin", and skipped a meeting with French President Emmanuel Macron. During his talk, Trump alternated between stream-of-conscious rambling about trade, Russia and North Korea and taking questions from reporters. "We had productive discussion on having fair and reciprocal" trade and market access. "We're linked in the great effort to create a more just and prosperous world. And from the standpoint of trade and creating more prosperous countries, I think they are starting to be committed to more fair trade. We as a nation lost $870 billion on trade...I blame our leaders and I congratulate leaders of other countries for taking advantage of our leaders." "We're negotiating very hard, tariffs and barriers...the European Union is brutal to the United States....the gig is up...there's nothing they can say." "We're like the piggy bank that everybody's robbing." "I would say the level of relationship is a ten - Angela, Emmanuel and Justin - we have a very good relationship. I won't blame these people, unless they don't smarten up and make the trades fair." "I feel that Kim Jong Un wants to do something great for his people...he's got an opportunity that, if you look back into history, few people have ever had." "This is a great opportunity for peace and lasting peace and prosperity." "It's going to be something that's always spur of the moment...this is an unknown personality many people don't know." "You know how they say you know whether you'll like somebody in the first five seconds? I think I'll know pretty quickly whether we're going to make a deal." "Some people like the idea of bringing Russia back in." "you'd have to ask President Obama because he's the one who let Crimea get away. He allowed Russia to take Crimea. I may have had a much different attitude." Several heads of state will be heading off on a taxpayer-financed "mini-break" in Canada today. 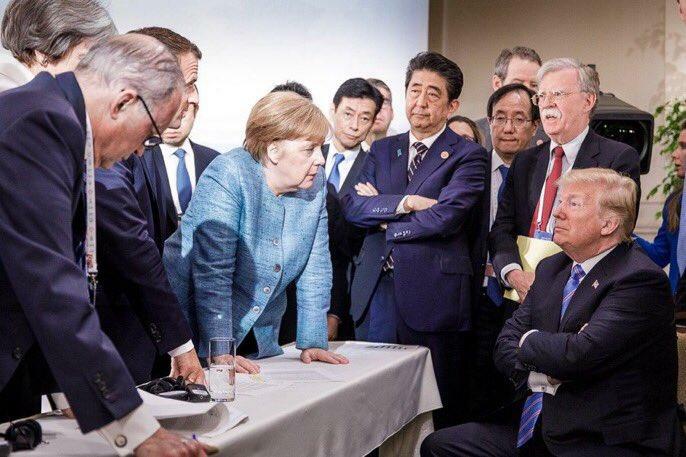 In all of its incarnations (over the past four years, we've gone from G-8 to G-6+1) the group hasn't really accomplished much since an initial burst of enthusiasm with the Plaza Accords and Louvre Accords in the 1980s. And this meeting likely won't be any different.